According to a New York Times article, in 2014 the U.S. emitted around 16.2 metric tons of carbon per capita. That's about 35,375 pounds of carbon per person. Needless to say, we have contributed significantly to global warming. 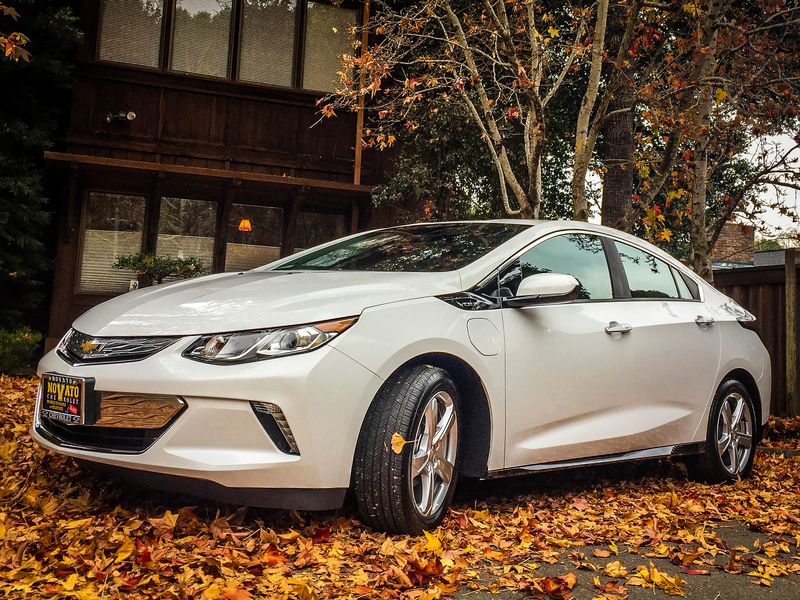 And despite being considered an environmentally conscious region, the Bay Area is a major contributor to those emissions. A household can help combat colossal carbon footprints in several ways. While sustainable/green design and construction have a great impact on the environment, sustainability will only come with changing the way we live and integrating that green lifestyle shift into our culture. The field of architecture has a major responsilibilty when it comes to climate change. Ned Cramer with Architect Magazine recently noted, "every architect should know, buildings consume some 40 percent of the energy in the U.S. annually, and they emit nearly half of the carbon dioxide (CO2), through greenfield development, cement production, and the burning of fossil fuels such as oil, gas, and coal." If these statistics hold true, then how we build, what we build, and what we build with needs to change. From energy use and water conservation to the materials used to build your home, Wagstaff + Rogers Architects is committed to preserving the environment for future generations by offering services in Sustainable Planning and Green Building. The firm's Green Design philosophy encourages environmentally responsible decisions at each phase of the design process, reducing negative impacts on the environment and improving the health of building occupants without substantially compromising the bottom line. It is an integrated, holistic approach that positively impacts all phases of a building's life-cycle, including design, construction, life-cycle operation, and decommissioning. A GreenPoint Rated or LEED (Leadership in Energy and Environmental Design) certified building will also typically bring a higher market value than a conventional building. Whether you are remodelling part of your home, building a home from scratch, or simply updating your home for energy and water efficiency, there are many facets of design and construction that can lower your home's carbon footprint and save you money on your water and energy bills, as we have written about before in this blog. 1. Location and community (if applicable): try to locate close to shopping and public transportation as well as situating the building for optimal solar access for active and passive design techniques. 2. Energy efficiency: focusing on the building envelope, including efficient windows, heating, cooling, and insulation. The goal is to use less fossil fuels to heat and cool and try to convert to sustainable types of energy while conserving by design. 3. Indoor Air Quality (IAQ): prioritizing use of Low-VOC (volatile organic compounds) and No-VOC paints and other less toxic chemicals for the health of occupants. 4. Resource conservation: using less and/or renewable resources as well as durable materials. 5. Water conservation: specifying indoor and outdoor plumbing fixtures that conserve water. 6. Innovations: envisioning and implementing new ideas that advance sustainable living into our culture. While sustainability is a key principle for Wagstaff + Rogers Architects, they also practice it in their individual lives. Reducing your CO2 emissions goes beyond the home; low-carbon living also means changing your lifestyle. Everything from what you eat to how you get to work has a carbon footprint. Recently, architect, Eric Rogers and his wife, Natalie, participated in Marin county's Resilient Neighborhoods program, a team challenge to reduce collective CO2 emissions to more sustainable levels while building community. The program is free and joining a team is relatively easy. "4,480,129 lbs. of annual CO2 emissions have already been reduced [through this program in Marin alone]. That's enough to keep an acre of Arctic Sea ice from melting every year or taking 613 Marin homes off the grid permanently!" If you're curious, you can get an idea of your own carbon footprint using a carbon footprint calculator, like the one provided by the EPA. Eric and Natalie reduced their CO2 emissions by about 16,717 pounds. Some actions proved more challenging than others, but overall they found many of these changes to be quite simple. All it takes is a little awareness. When it came to shopping choices, Eric and Natalie made a commitment to buying previously owned items if possible: "We check online for garage sales, and watch Nextdoor.com, Facebook, and Craigslist for things that we need or want before we buy something brand new." Another of their goals was to buy as little as possible from big-box, chain stores, and shopping local retailers or farmers markets instead. The two admit, "this was a tough commitment for us because we are busy people and we've grown accustomed to buying products online." Think of all those Amazon boxes! As a simple alternative to produce and vegetables grown with GMO techniques, Eric and Natalie also started to buy organic produce, generally fairly local in origin. Local products mean fewer emissions and more support for local businesses, in turn, creating stronger community. There were several actions that Eric and Natalie implemented to work towards lowering their waste contributions. One of the easiest things that they did was avoid single-use plastic containers, especially bottled water. When they do have to buy something in a plastic container, they make sure it's recyclable. The couple also started composting food scraps. In our conversation, Eric commented, "For all of the years that I have been involved in green building and sustainable living ideals, I never thought about composting our food scraps from our own home. Since the Resilient Neighborhoods program, this is one of the simplest and most rewarding ideas of reducing landfill waste and it is something that you see the results of everyday." If your household isn't doing this yet, consider throwing those food scraps in your green bin or composting for your garden. Fixing broken items, instead of throwing them away and buying again, was something the handy couple were already well-versed in: "We joke that when I married her, she automatically came with her own toolbox and there was no negotiating combining mine with hers." Not all of us are talented do-it-yourselfers, but learning to fix something on your own is not only gratifying, but also a gift that keeps on giving. YouTube is a good place to start learning fix-it tricks. The toughest action towards reducing waste for Eric and Natalie was downsizing their landfill bin. "It is so easy to throw things away when you don't know what else to do with them," Eric admitted. "Once we downsized our garbage can, we had to think about what to do with items we were throwing away. In retrospect, this is probably one of our biggest contributions towards a more sustainable lifestyle." Before just tossing something into the garbage can, think about if there's a more appropriate place to dispose, recycle, or donate it. With a little more mindfulness, Eric and Natalie began to conserve water by simply reducing shower time to 5 minutes, turning off the water while brushing their teeth, not letting it run when doing dishes by hand, and ditching the sprinklers for watering the yard only when needed. Switching to doing laundry with mostly cold water instead of hot water was a harder habit to break. Even though it's 35 years old, the home they purchased in 2016 already had high-efficiency toilets. The two have also pledged to buy an Energy Star dishwasher and a cover for their pool (to reduce evaproation) in an effort to further conserve water. Making an appliance/mechanical systems replacement schedule, enabling sleep modes on computers/monitors, and using to energy efficient light bulbs were some of the more effortless steps Eric and Natalie took to conserve home energy. They also plan to get a certified home performance assessment (about $1,000) that can qualify them for up to $6,500 in rebates through Energy Upgrade California. As an architect, Eric regularly recommends certified assessments to his clients. He's hoping to use his own home as educational example in the future. If you're interested in saving more energy in your home, you can also complete a DIY assessment-there are no rebates unless it's a certified assessment though. Conserving energy is important, but what kind of energy you're using also matters. Eric and Natalie were already getting renewable energy through Marin Clean Energy, but switched to MCE's Deep Green program, a 100% renewable energy plan, for an average increase of about $4 per month. Resilient Neighborhoods also aims to help fight global warming through education and adovcacy. One action Eric and Natalie are working on is writing and/or calling elected representatives in support of strong climate action. Communicating with elected officials on a personal level is a way to get attention for the ideals we believe in. Natalie and Eric are already infusing themselves into local government to make positive changes regarding a sustainable future for their Novato neighborhood and to help decrease the collective carbon footprint! Contacting officials and educating others about how to fight climate change takes time, but once you build those connections, it's very easy to continue the correspondence and influence your local government toward positive environmental change. These are just a few of the actions the couple opted to take. The program itself provides a deeper understanding and more exhaustive set of plans that can help fight global warming by reducing carbon emissions. All these seemingly small changes really add up. For Eric and Natalie, they added up to about 16,717 pounds of carbon! Imagine how many pounds of carbon we would be cutting out if all of us made minor adjustments to our habits and lifestyles. If you want a quick run-down of actions that you can implement immediately in your everyday life, the University of Michigan has a great factsheet that will get you thinking about how you can begin to reduce your carbon footprint today. 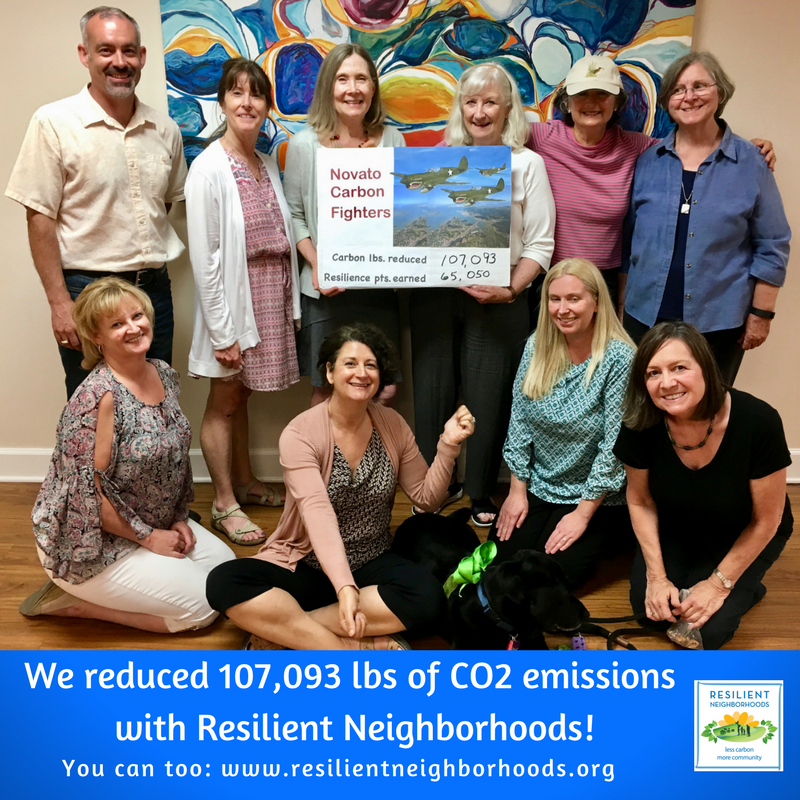 Or why not participate in the Resilient Neighborhoods program and build stronger ties to the community while going low-carbon? One final detail that's worth mentioning about this couple's sustainability story: upon completion of the Resilient Neighborhoods program, Eric and Natalie's team gifted them 2 tons of carbon offsets as a wedding present. 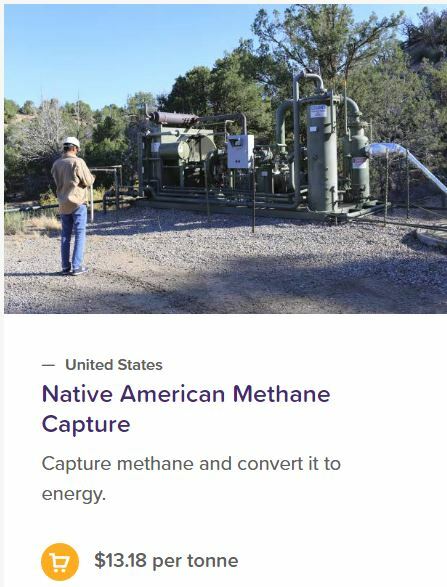 The offset purchase funded the Native American Methane Capture project. What a brilliant gift idea!